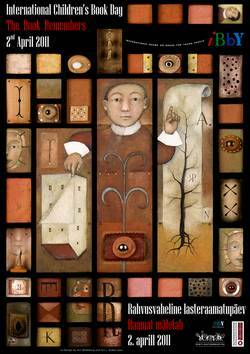 Helen Limon was recently announced the winner of the 2011 Frances Lincoln Diverse Voices Childrens Book award. The award is for a manuscript that celebrates cultural diversity in the widest possible sense, either in terms of its story or in terms of the ethnic and cultural origins of its author. Below Helen is lovely enough to answer some questions on her forthcoming book, being a writer and what it’s like to win this writing award… THANKS HELEN! – Why did you enter the Frances Lincoln Diverse Voices Childrens Book award? I entered because it seemd a great opportunity to get a thoughtful reading of my manuscript and because I think Seven Stories is a fantastically wonderful and important resourse for children’s books and because some of the characters in Om Shanti, Babe such as Cassia’s gay dad, the deaf girl, Nandita, and the middle-class Indian family are not frequently represented in children’s books. – Where did inspiration for Om Shanti, Babe come from? Inspiration came from a two week winter holiday in Kerala and was followed by months (and then even more months) of research. – Can you tell us more about the mythology of the Theyyam and how it is important to the story (without giving too much away)? The Theyyam is a very ancient and very colourful part of the spiritual culture of Kerala, particularly in the northern hill regions. It is kept alive through private donations and celebrated by karali of many different religions and backgrounds. In the story, Cassia has an encounter at the Theyyam which sets in motion some important changes in her relationship with the young Indian charater, Priyanka. – What has happened to Om Shanti, Babe since winning the award? Winning is AMAZING! I’ve had so many opportunities to be involved in interesting projects since the award and it has made me feel like a ‘proper’ writer. How do you find the publishing process? I love the publishing process – looking at book covers, thinking about strap lines and sharpening things up. I have even enjoyed tidying up my eccentric punctuation! – Favourite part of being a writer? The opportunity to talk to groups about why children’s books are hugely important and because they always give me tea and (great) cake. – Least favourite part of being a writer? Not having enough time to write! – Advice to aspiring writers? Read, write, read, write, don’t edit yourself too much, let it flow, make mistakes (sometimes they turn out to be the best bits) read, write repeat from start! I went back inside and tugged at the doors. The wooden frame stuck and they closed with a bang. Inside the bedroom, a ceiling fan turned, gently moving the warm air around just enough to make it breathable. I slid out of my shoes and put my bag on the bed nearest the door. The mosquito nets were a glamorous touch, but I’d expected our room to be a bit more five-star-and-mini-bar. Dad wouldn’t have rated it at all. I cranked up the ceiling fan and, as the blades began to turn faster, something moved on the wall. A pale pink lizard had scuttled along and stopped just inches away from the light switch. It blinked. A tiny tongue shot out of its mouth and slid back between its jaws. I stood very still, holding my breath. The lizard blinked again as I moved slowly away from the wall and ran for the door. Lula would have a fit when I told her and, while Mr Chaudhury got rid of it, I would be able to reclaim the order book. But when I got downstairs no one seemed bothered about mini-beasts stalking the walls. ‘They are called Geckos, Cassia. We think of them as our guests. They will help keep your room free of spiders and flies,’ Mr Chaudhury said. His teeth were very white and when he smiled, his mouth crinkled at the corners. What a creep. He’d made it sound like geckos were his best friends and that I was some kind of teen psycho-killer. Lula looked a bit embarrassed. She had told me loads about India, but, clearly, there were some things she’d left out. The Frances Lincoln Diverse Voices Childrens Book Award is for a manuscript that celebrates cultural diversity in the widest possible sense, either in terms of its story or in terms of the ethnic and cultural origins of its author. The prize of £1,500, plus the option for Frances Lincoln Children’s Books to publish the novel, will be awarded to the best work of unpublished fiction for 8-to-12-year-olds by a writer, aged 16 years or over, who has not previously published a novel for children. The writer may have contributed to an anthology of prose or poetry. • Take positive steps to increase the representation of people writing from or about different cultural perspectives, whose work is published in Britain today. • Promote new writing for children, especially by or about people whose culture and voice are currently under-represented. • Recognise that as children’s books shape our earliest perceptions of the world and its cultures, promoting writing that represents diversity will contribute to social and cultural tolerance. • Support the process of writing rather than, as with the majority of prizes, promoting the publication. Tags: author interview, Frances Lincoln Diverse Voices Childrens Book Award, Helen Limon, interview, multiculturalism, Om Shanti Babe, Theyyam | Permalink. It was won by Helen Limon for Om Shanti, Babe, a story about growing up, family and friendships that the judges described as ‘Fabulous . . . laugh-out-loud funny’. The closing date for the next award is 31st December 2012. Om Shanti, Babe is the tale of teenage Cassia, who is forced to drop her preconceived ideas when she joins her mother on a business trip to south India, takes in fair trade and environmental issues alongside Cassia’s struggles to accept her mother’s new Indian partner, her spiky tussles with fashion-mad friend-to-be Priyanka and her crushes on pop star Jonny Gold, and Dev, a boy she meets on a train. The Award, now in its third year, was founded jointly by Frances Lincoln Limited and Seven Stories, the national centre for children’s books, in memory of Frances Lincoln (1945-2001) to encourage and promote diversity in children’s fiction. The prize of £1,500 plus the option for Janetta Otter-Barry at Frances Lincoln Children’s Books to publish the novel is awarded to the best manuscript for eight to 12-year-olds that celebrates diversity in the widest possible sense. To date Janetta has commissioned or published six books by writers who have entered the award: the Takeshita Demons trilogy by Cristy Burne, winner of the inaugural award, Too Much Trouble by Tom Avery, the 2010 winner, and A Hen in the Wardrobe and Chess and Chapattis, the first two titles in the Cinnamon Grove series by Wendy Meddour, who entered the 2009 award. By coincidence, both the winner and the second-placed author in this international award are from Newcastleupon-Tyne (the judges are not given any details about the writers until they have made their decision). Karon Alderman, who teaches literacy skills to adults, received the Highly Commended award for For Keeps, the tale of a young asylum seeker and her family. Australian author Michelle Richardson received a Special Mention (an award which the judges can choose to give to a manuscript that shows great potential but is not ready for publication) for Tek, about a young girl from the Aboriginal Australian Murrinh-Patha community who can communicate with the ngepan, the spirits of the dead. The winning author, Helen Limon, lives in rural Northumberland with her partner, a painter. Her daughter, who is studying tailoring in London, had an influence on the character of Priyanka with her passion for fashion. Helen spent her childhood mostly abroad until she was 10, including four years in Penang, Malaysia, where she learned about life in England from second-hand children’s books. After spending her early adulthood travelling in Indonesia, Australia and New Zealand, Helen arrived in the North-East as a student at Newcastle University. She started writing in 2000 when she set up a children’s literacy project in a neglected allotment behind a Metro station in Newcastle. The project turned into a publishing venture for local authors and illustrators, Zed Said. Helen has just finished a PhD in creative writing at Newcastle University. But where do you get your ideas? The inspiration for Om Shanti, Babe came from encounters with local people on a 2009 visit to Kerala. She said: “Talking to the mothers about their lives and their ambitions for their families, and listening to what the children said they wanted, inspired the story and made me conscious of the social and environmental themes that are woven into the book. And a Too Much Trouble party to boot! The presentation at Seven Stories also celebrated the publication of Tom Avery’s contemporary Oliver Twist story, Too Much Trouble, winner of last year’s Award. impressed them. The decision to give the Award to the winner was unanimous. realise her dream to follow her mother into business. help a bullied schoolfriend, Jaz. Tags: announcement, Babe, competitions, diversity, Frances Lincoln, Frances Lincoln Diverse Voices Childrens Book Award, Helen Limon, multiculturalism, Om Shanti, Seven Stories, Tom Avery, Too Much Trouble | Permalink. Even when you’re straddling two cultures, it’s nice to fully immerse yourself in aspects of one. Like having a chocolate fish moment. Matter of fact, I’d like one now. Like Miku Takeshita, the hero of Takeshita Demons, many children leave their country of birth to live in another country. My sisters and I did, leaving New Zealand to live in our mother’s home country of Australia. Even so, moving to Australia was a culture shock and full of all the adventures of a new school, new friends, a new way of speaking, even new names (I was suddenly Creesty instead of Crusty). But we explored this new life and grew to love it and now, years later, we are bringing up our own children in Australia. But we never lost touch with our Kiwi roots. My sisters and I are, and will always be, a mix of Australia and New Zealand. We still love New Zealand and the childhood we had there. And that’s great…it adds to the melting pot of culture and experience that makes up the world. I think that’s the way it should be, that it’s vital that no child is forced to give up one culture to fit into another. BUNKO is a Japanese word meaning ‘Storehouse of Literature’. It is made up of two kanji: BUN (sentence) = literature and KO (warehouse) = storehouse. That’s where the International Children’s Bunko Association plays such an important role for ‘international’ children, who move countries a lot, or who feel they are straddling more than one country or culture. It was originally set up in the Japan, as a means for keeping English-speaking chidren living in Japan connected with their culture and literature. Each branch of the IBCA provides a volunteer-run mini-library for bilingual and bicultural or multicultural children. Branches now exist in Japan, England, America, Australia, Brazil, France, Italy, Germany and beyond. Overseas branches provide childrens books and cultural experiences celebrating Japanese language and culture, and the Japanese branches provide for children from French, German, Korean and English backgrounds and cultures. Never read it? You should! Mahy is a genius and this is hilarious at any age. Each ICBA branch aims “to create an atmosphere in which the children feel at home,” and I think that’s such a fabulous thing. Sometimes it’s just so comfy to slip into a different culture completely, to stop straddling the fence between two cultures and totally embrace one or the other, even if just for a few minutes. So three cheers for the International Children’s Bunko Association! I think it’s a tremendous service. And thanks to Mrs Keiko Holt! Many thanks to Mrs Keiko Holt, Japanese advisor for the Takeshita Demons series, for introducing me to the ICBA. Mrs Holt is an integral member of the ICBA in the UK and an invaluable part of the editing process for each Takeshita Demons book…. THANK YOU for all your hard work!!! Tags: bilingual libraries, international childrens literature, multiculturalism, New Zealand, resources | Permalink. I am a member of the Childrens Book Council of Australia and recently recieved their terrific February newsletter. In it was an awesome list of suggestions for ways to celebrate International Childrens Book Day, which is on April 2, the birthday of Hans Christian Anderson. 9) invite fellow staff members to have a lunch or gathering where they speak for about a minute or so about their favourite childrens book and light a candle for world peace. If you’re interested in celebrating International Childrens Book Day with other book lovers, check out your local branch of the International Board on Books for Young People (IBBY): many branches are celebrating with dinners, activities and more. Tags: activities, Childrens Book Council, diversity, International Board on Books for Young People, International Childrens Book Day, multiculturalism, resources | Permalink. Remember: tailor the spookiness of your creatures to suit. 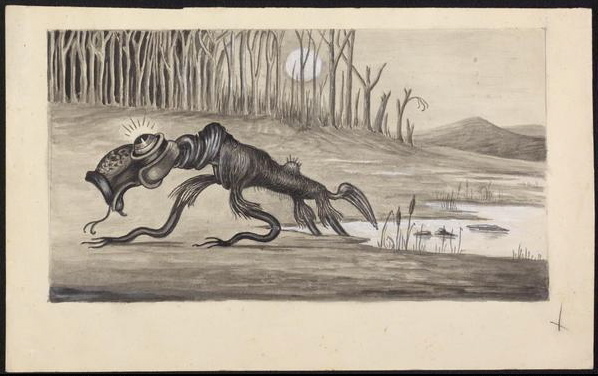 This drawing of a bunyip is scarier than anything I ever imagined! Looking for ways to celebrate International Childrens Book Day (April 2, the birthday of Hans Christian Anderson)? Want to entertain a bunch of kids for a couple of hours? Like to imagine weird and wonderful creatures? Give this activity a shot: Remember…the creatures you talk about can be as scary (or not) as you choose. For example, you might skip zombies in favour of fairies, or talk about unicorns instead of the Loch Ness Monster. A labelled drawing of the Japanese tanuki, thanks to the Shigaraki Tourist Assocation. What type of monster would you draw? THE TANIWHA OF WELLINGTON HARBOUR by Moira Wairama features the Maori taniwha. – Read books about some of the weird and wonderful monsters that exist in mythology from around the world. – Ask the kids to grab their pens and paper and dream up their own monster. Encourage them to create a monster that is specific to them. Draw the monster and label its attributes. Does it have strong legs for jumping mountains? Does it carry a cake for feeding its friends? Does it wear sunglasses to protect its eyes from the snow? Happy International Childrens Book Day! Tags: activity, bunyip, International Childrens Book Day, Japanese mythology, multiculturalism, taniwha, tanuki, tokoloshe | Permalink. Want something fun to do on a hot (or cold) day this holidays? Want to make sure you keep your New Year Resolution? Here’s the perfect activity to keep you busy AND motivated to succeed in achieving your goals! – Daruma dolls are based on Daruma, the Japanese name for the Indian monk who started Zen Buddism. – The doll has no legs, because the monk once meditated for so long that his legs fell off. – Daruma dolls are heavier on the bottom than on top, which means they bounce back when struck down. This makes them a symbol of optimism, determination and good luck. – Daruma dolls are very hairy, symbolising long life. His hairy eyebrows are shaped like cranes, birds said to live for 1000 years. Daruma dolls are usually painted red, the colour of the monk’s robes, but their eyeballs are left unpainted. When you decide to pursue a new goal, you paint one of the daruma’s eyeballs. When you have achieved your goal, you paint the other eyeball to match. As you make your daruma, think about what you would like your goal or resolution to be. 3) Blow up a balloon to the size you would like your daruma to be. Remember: daruma dolls don’t have arms or legs, and their face is slightly sunken into their bodies. 4) Dip the newspaper strips into the glue mixture and cover the balloon in six layers of paper strips. Let the layers dry overnight. 5) Use masking tape to stick the bowl to the bottom of the daruma. 6) Cover the balloon and the bowl with more layers of newspaper, working to create the shape of a daruma doll. 7) Use strips of white paper for your final layer. 8) Paint your daruma, leaving his eyeballs unpainted. 9) Think of a goal you would like to achieve. When you have decided on your goal, paint in one of the pupils. 10) Put your finished daruma on display. Every time you see him, you will remember to work towards your goal. 11) When you have achieved your goal, paint in the daruma’s remaining eyeball. Tags: daruma, Japanese craft ideas, Japanese dolls, Japanese legends, multiculturalism, New Year activities, New Year Resolutions | Permalink. I’m neck-deep in Monster Matsuri after a FABULOUS Children’s Book Week (hello to everyone I met: thanks for being such great audiences!). But which did I choose? Well, the kanji you choose when naming a child can be used to direct the fortunes of that child, so it’s good to choose names that can be written using a lucky number of strokes. For example, the number 4 in Japanese can be pronounced ‘shi’, which also means ‘death’, so 4 is an unlucky number in Japanese (like 13 in Western cultures). Luckily, none of the kanji combinations for Miku require 4 strokes. For Miku, this is Takeshita (竹下), which requires 9 strokes to write. This is not a particularly auspicious number, but life-long luck is not determined by this number alone. Your total fortune can be influenced by the strokes in the rest of your name. This could be 12 (美久 or 未来), 17 (美空) or 18 (美紅). Fortunately for Miku, 17 and 18 are relatively lucky. Since this value influences Miku’s fortune in early life, I guess she doesn’t really need to have a lucky number here. Let’s face it, if your teacher is a nukekubi demon and your brother has been kidnapped, you’re not really off to an auspicious start. This could be 21(竹下美久 or 竹下未来), 26(竹下美空) or 27(竹下美紅). Here 21 is a lucky number, which bodes well for Miku’s personal relationships. 4) Is there some way Miku could write her name to give it her own special zing? And so that was it: Takeshita Miku is written 竹下未来 and means “Under-the-bamboo Future”. Which is a perfect name for Miku, since she carries so much hope for her family, and since her future is intertwined with the future of the world as we know it. Tags: diversity, future, Japanese mythology, luck, multiculturalism, names | Permalink.